I struggle with Father's Day, I'll be totally honest. I don't know why I find it so hard to cope with, but I either forget the husband, or my own dad, I can't remember both at once. I always end up leaving it far later than I would like to, particularly if I need to post something! 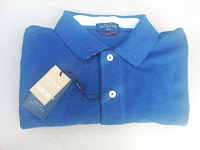 This year though, we have been sent something lovely to review, from the House of Fraser Father's Day range which is just perfect for my dad and L was keen to help out and full of reasons why Granddad should get something special. "My granddad is a good granddad and he has been nice to me ever since I was born. We’ve been to Legoland, the zoo, on holiday and on train rides. He deserves a present cos he’s my granddad." With an accolade like that, House of Fraser had quite a responsibility on their hands, but they weren't worried. They had this very smart Howick Harvard Pique Polo shirt for us and it was the perfect choice. Made of soft and comfortable cotton-pique fabric, it has a smart-casual look that makes it very versatile and ideal as a gift. Particularly if you are not entirely sure where the recipient would want to wear it! If you are unsure what size to get, House of Fraser have lots of other gifts in their range to choose from, starting at just £2.40 for a really stylish binocular themed keyring. There are lots of savings to be had at the moment, and items are helpful arranged into different price brackets and also by category, making it really easy to find the perfect gift. I love this Linear Aeroplane, down from £25.00 to £17.50. 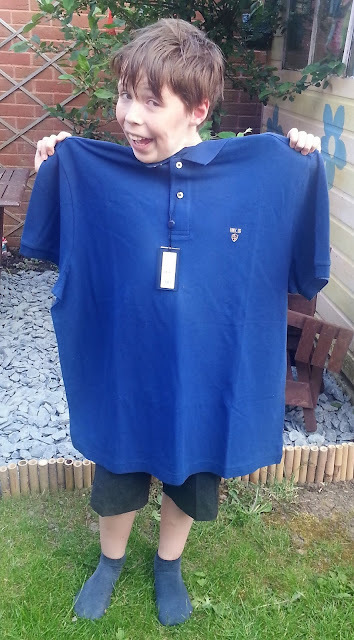 L had great fun reviewing his gift for granddad, as you will see from the photos, and he is confident that he is going to love his new shirt. He had better, future trips to Legoland might depend on it! We were sent the item free of charge for L to inspect and approve! All opinions are our own. I struggle with Father's Day too - not because I forget but the men are so hard to buy for! The polo shirt is a great suggestion, practically every man in my life wears one!! Love that face and it is a super colour, hope grandad loves the t-shirt and has a great Father's Day.